Yesterday Matt and I got a treat. A friend of ours invited us out into the nations in his very own Omaha home. 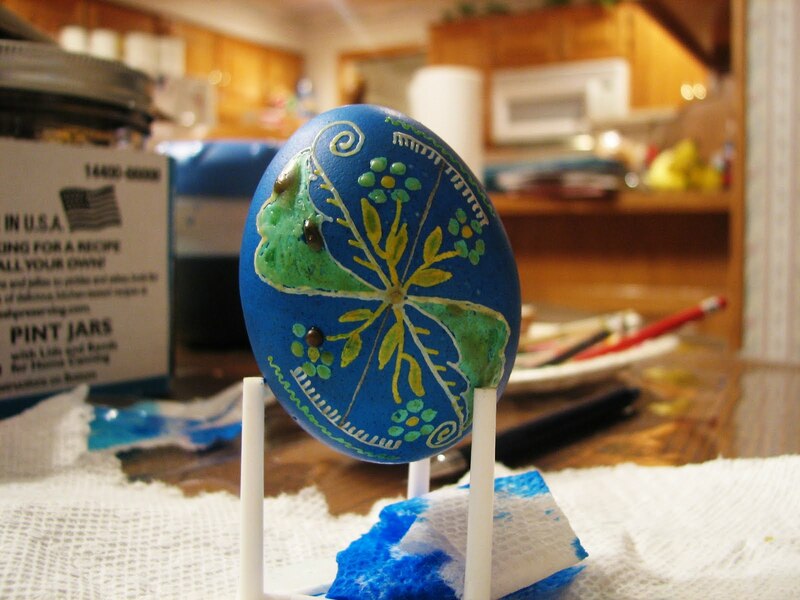 We learned the really cool art of Pysanky–writing Ukranian Easter eggs. The eggs are “written” with a series of wax and dye applications to a stunning degree of intricate beauty. 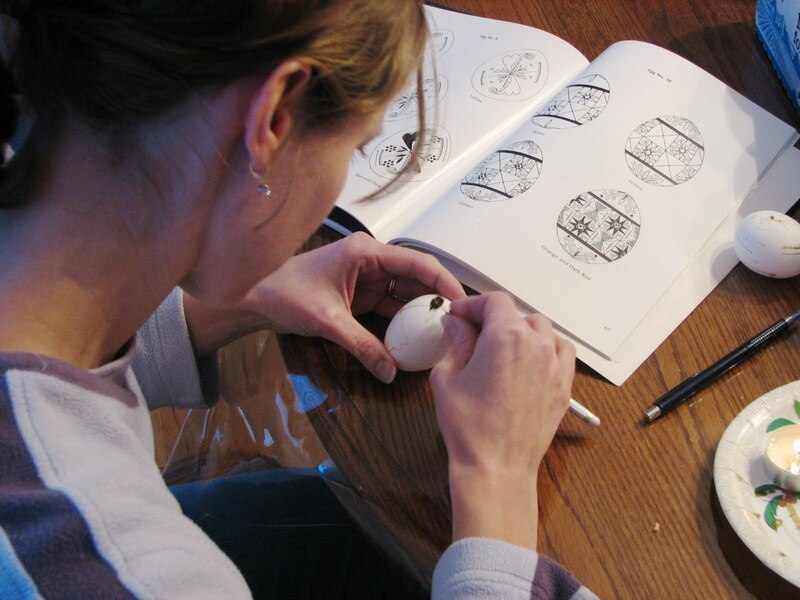 Well, our eggs may not be so stunning, but in the hands of a master, wonderful things happen. 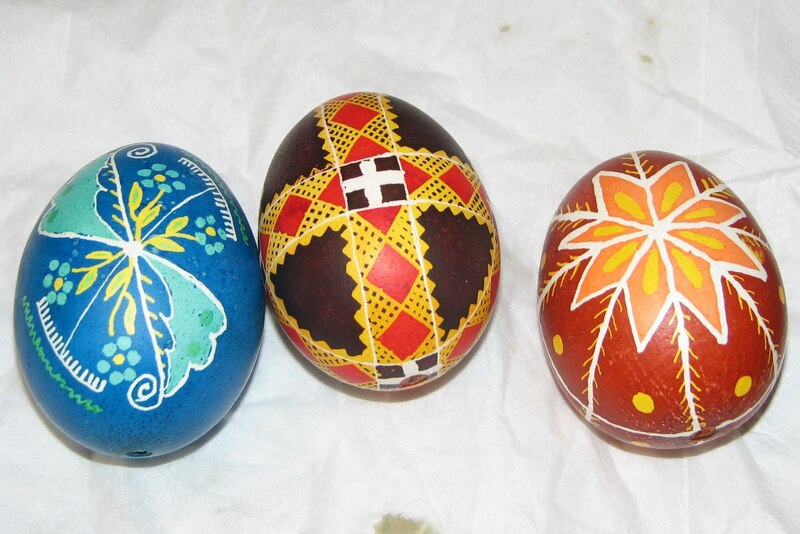 Pysanky is a great hobby for people who like to collect tools! Orest is giving us a tutorial in “Pysanky Central.” The jars are filled with different colors of dyes. The “tiny copper funel on a stick” tool is called a kistka. 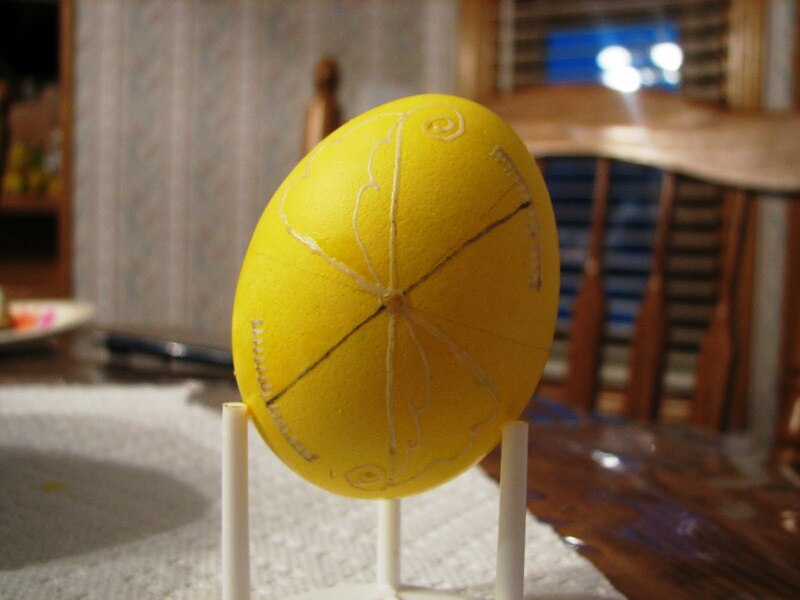 It is filled with a little beeswax, heated by a candle flame, used to draw with wax on the eggs. Once we picked a pattern, and figured out how to use the kistka, we set about drawing the parts of the design that we wanted to remain white. Then we dipped our eggs into yellow dye and let them dry. Matt’s egg after the yellow bath. My egg after the yellow bath. Next we drew wax over the parts of the design that we wanted to remain yellow. We kept adding layers of wax and color to complete the designs. Matt’s egg after the final dye bath. My egg after the final color bath. After the final dye has dried, the wax is melted from the eggs to reveal how well you did. The total beauty and unforseen flaws can now be discerned. Where did the egg in the middle come from? Oh yeah, Orest whipped that puppy out in between helping us newbies. The spiritual analogy is just as breathtaking. I long to stand before Jesus on his throne, let my wax drip away in the heat of his glory, and see the ultimate design he has crafted in my life. Each day, each triumph and failure is a color tone or line of detail. In the time before the unveiling, I will be satisfied to know that I am crafted in his hands. 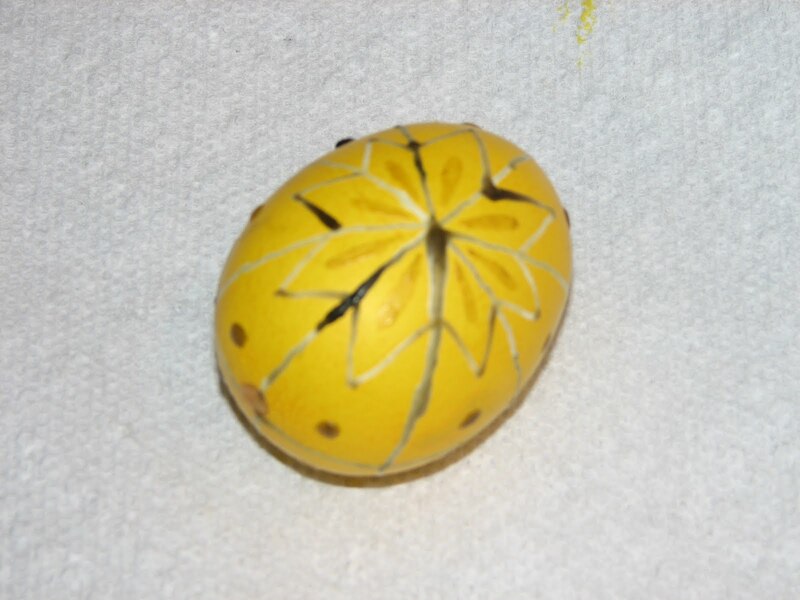 This entry was posted in Kris' Heart and tagged pysanky, Ukranian Easter eggs. Bookmark the permalink. ← What Can God Do in 10 Days? Nice spiritual analogy Kris. 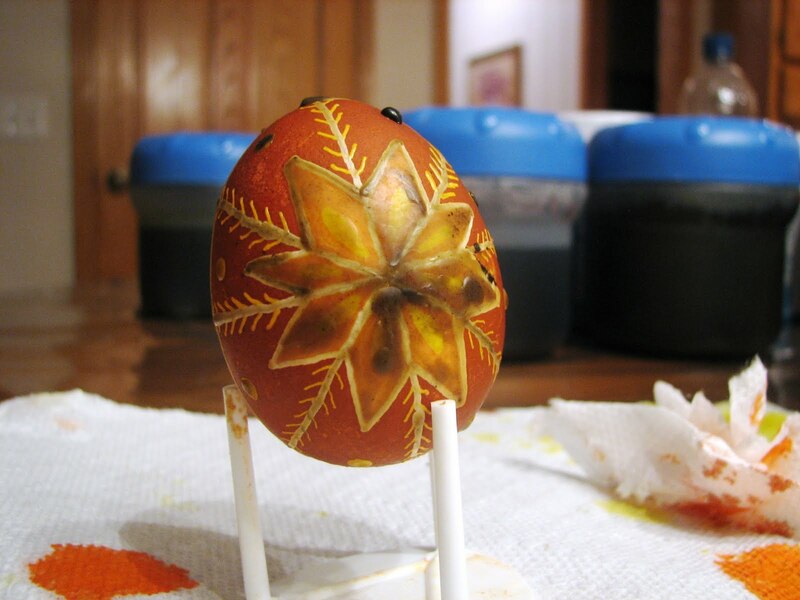 Since the eggs are a symbol of rebirth themselves, we are all "pysanky" in the master's hand, the final beauty of which will only be revealed when we are reborn. Beautiful, Kris. Both the eggs and your metaphor. Thank you!